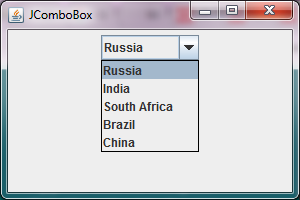 JComboBox consists of an editable field and a drop-down list. 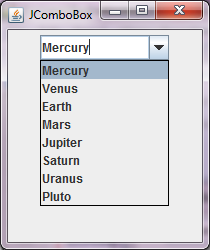 A user can either select or edit any value from drop-drop list. 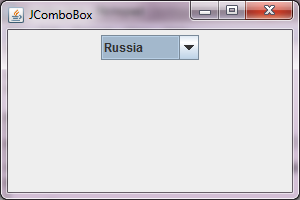 In order to handle the events generated by clicking or editing in combobox created by JComboBox, an ActionListener interface is implemented. JComboBox is a is a component which extends JComponent class and it can be added to a container like JFrame or a component like JPanel. 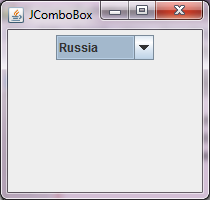 public JComboBox() Creates a JComboBox with a default data model. 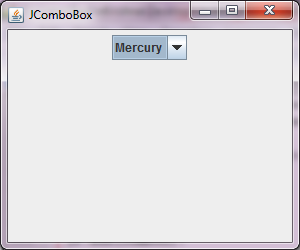 public JComboBox(E items) Creates a JComboBox that takes its items from an existing array. public JComboBox(ComboBoxModel <E>) Creates a JComboBox that takes its items from an existing ComboBoxModel. public void addItem(E item) Adds an item to JComboBox. public Object getSelectedItem() Gets the item selected by the user from JCombobox. 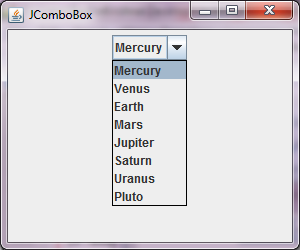 public void setEditable(boolean b) Allows to edit the option selected from the dropdown list of items in JComboBox. 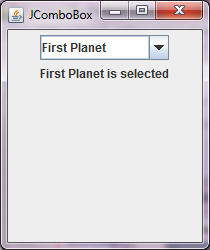 addActionListener(ActionListener a) Adds an ActionListener. 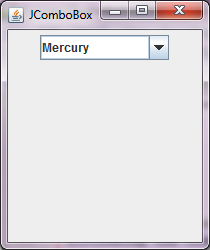 Remember the last JCheckbox(ch4) will not be visible because its icon has covered it, but it is still a checkbox, just covered by its icon. In the upcoming code, we are going to handle events when a JRadioButton is checked or unchecked. In the next code, we have also combined a JRadioButton with a JLabel to add an icon/image next to a radio button. We must implement the ActionListener interface to handle the events associated with the JComboBox. Let's see how do we do it with an example.